Learn how to prepare for a big mountain expedition on the most glaciated peak in the lower 48 States. The emphasis of this course is on building foundational mountaineering skills while using Mount Rainier as a classroom. The instruction is designed for climbers seeking to further their skills for larger peaks or to gain independence in a glaciated environment. During the spring season we will utilize snow shoes and sleds for travel, and learn how to build a secure expedition snow camp. The school curriculum includes instruction on the fundamentals of glacier mountaineering, climbing on snow and crampon techniques, self arrest, traveling as a rope team and navigation, crevasse rescue, covering the essential climbing skills needed to travel safely in the mountains. Our expedition training course allows more time to develop advanced mountaineering skills, preparing aspiring climbers for expeditions to Denali, Aconcagua, or the Himalaya. All our mountaineering courses provide breakfast, dinner and hot drinks on the mountain. We utilize the lightest high quality mountaineering tents, stoves and group equipment available to lessen pack weight. We meet in Ashford for orientation and equipment check the first day of the course. The next day we make our way to the trailhead and ascend to our basecamp. Each day is dedicated to learning expedition mountaineering skills, on day four we make our ascent to Camp Muir. Day six we return to the trailhead. Discussion topics will include: Clothing and equipment, packing a backpack, mountain weather, glaciology, acclimatization, route finding, snow camp skills. Our professional guides will follow the above curriculum, introducing the basic mountaineering skills necessary to make a successful summit climb. Trailhead: Paradise Meadow, 5400 ft.
Panorama Point Basecamp: 6,000 – 6,300 ft. Trail synopsis: Our route begins at Paradise Meadows gaining elevation moderately until reaching our basecamp near tree line around 6,000 feet. The trail is snow covered during the spring season so we will utilize snow shoes and sleds for travel. We continue our climb to Camp Muir, taking a break near split rock between 7,600 – 7,800 feet. From here we ascend snow, kicking steps and moderately gaining elevation to our second (8,600 ft.) and third breaks reaching the top of Moon Rocks at 9,200 feet. We take our final break shortly before reaching Camp Muir. The day is spent training, adjusting to the altitude, and enjoying views of Mount Rainier National Park. A full day to develop advanced glacier mountaineering skills including anchors and crevasse rescue. Professional instruction from NWAG staff. Small teams for a personalized experience. Breakfast, dinner and hot drinks are provided on the mountain. This course is considered entry level and is suitable for climbers in great physical condition with no prior mountaineering experience. Two full days of mountaineering training is included in the program. No acclimatization is necessary for this program. Read our Goals and Fitness page for recommendations on how to best physically prepare for this adventure. We lead the Mount Rainier Expedition Training at a 3 to 1 climber to guide ratio ensuring that you receive personal attention and hands-on instruction throughout the course. Plan to arrive the day before the course begins. Following introductions our guides will conduct a thorough gear check. Throughout the days guides will host discussions on numerous mountaineering topics. The hike to basecamp takes 2 to 3 hours. The team will set camp between 6,000 – 6,300 feet depending on conditions. During the afternoon guides will continue instruction as time warrants, we prepare dinner and relax for the evening. Today is dedicated to learning the fundamentals of mountaineering. The course instruction includes snow climbing, use of ice axe and self-rescue, crampon techniques, rope travel, and basic introduction on knots and anchors. Each team member will be assessed throughout the mountaineering school. You will need to demonstrate adequate fitness and proficiency in climbing skills as your safety is our priority. After mountaineering training, we return to camp and prepare for our climb to Camp Muir. The team enjoys dinner and early to bed for the next day’s climb. The hike gains 3400 feet to Camp Muir and takes 5 – 6 hours. We descend the route to high camp. During the afternoon guides will continue instruction as time warrants. Today is dedicated to developing advanced glacier mountaineering skills, preparing aspiring climbers for expedition mountaineering. We continue building on the essential skills needed to climb higher peaks. Instruction includes navigation, crevasse rescue, snow protection, ascending fixed lines, belaying, rappelling, and rope management. After enjoying breakfast, we wrap of skills training and break camp, pack our gear and retrace our hike back to the trailhead. We generally arrive back to the trailhead by early-afternoon and conclude our adventure in Ashford. Plan to depart the day after the course ends. 10:00 am, the morning of the course, we meeting in Ashford. We will email you PreClimb info including gear list and departure details upon registration. $1000.00 deposit per person includes non-refundable registration fee, due with application. Balance due 120 days prior to start date. Our course goal is to learn and practice foundational mountaineering skills. As such, a summit attempt is not one of our goals. Date changes are not available for this departure. Participants age 16 & 17, on a fixed date group climb, and accompanied by parent or legal guardian. Participants age 15 or under, NWAG requires a private climb, and accompanied by parent or legal guardian. A minor climber must be accompanied by their parent/legal guardian throughout the entirety of the program. If either climber must descend at any time during the program, both climbers must descend together. We highly recommend that all participants consider travel and trip cancellation insurance. Travel insurance offers the best possible protection in the event of a sudden, unexpected illness or injury prior to or while traveling. 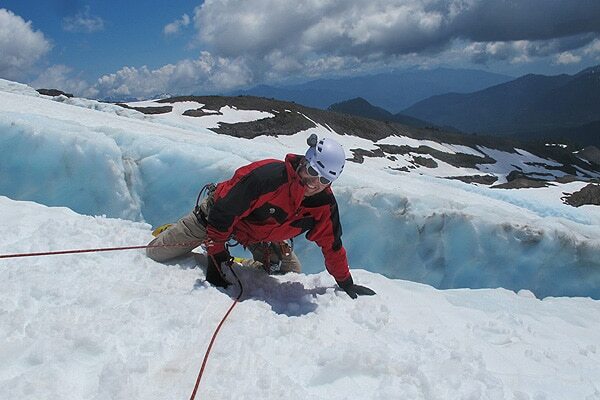 Northwest Alpine Guides does not insure you against these risks. For more info about current coverage plans and quotes please visit. Adventure Plan and Adventure Plus Plan differ only in the coverage option which allows you to Cancel for Any Reason. In order to receive Cancel for Any Reason coverage you must purchase the Adventure Plan Plus within 15 days of paying your deposit or payment with NWAG. We recommend Signature Travel Insurance. For travel insurance or Global Rescue membership. Since departures require a minimum number of participates, Northwest Alpine Guides must adhere to a stringent refund policy. The policy is intended to protect participants who have otherwise committed time and resources to the departure. Please read our Online Reservation for Terms and Conditions. During the Mount Rainier Expedition Training 6-Day Course, Northwest Alpine Guides will provide group meals, (4) breakfasts and (4) dinners while on the mountain. You will need to provide your own lunch and snack food on the mountain. We recommend a variety of snack food for eating on the go, we do not stop for a big lunch break, we eat during short maintenance breaks throughout the day. The idea is to keep your energy level up for the climb eating small amounts about every hour or so. Some examples of snack-lunch foods are dried meats (salami), jerky (turkey, beef, fish), tuna fish, cheese, crackers, bagels, dried fruit, nuts, chocolate, candy bars, gummy candy, cookies, energy bars, GORP trail mix. The importance of having foods that you like to eat cannot be overstated. Eating properly is the key to maintaining strength while in the mountains. A diet of sweet, sour and salty foods is recommended. When preparing lunches, please do not bring food items that require cooking or extensive preparation. Here is an example of meal items NWAG provides and our guides will prepare during group breakfasts and dinners. For those with special meal concerns we recommend bringing food to supplement the group meals we provide. We can accommodate most common food allergies within the meals we provide. We do not serve fish, shell fish, peanuts, tree nuts, milk or egg. In cases such as vegetarians, we are easily able to leave out the meat before serving pre-planned group meals. Northwest Alpine Guides is unable to accommodate vegan, gluten-free, or other types of special meal concerns. You will be happier providing your own meals. Most climbers will fly into Seattle-Tacoma International Airport (SEA) the evening before the program and rent a car for the hour and forty-five minute drive to Ashford, Washington. Northwest programs our itineraries reflect the date and time the program begins at a start location (Mount Rainier). When flying to Washington State you will need to arrive the day before the climb begins to meet the group at the program start location. With regards to your departure flight, our return time to the program start location is often unpredictable. We suggest a hotel reservation for the night of the last day and plan to return home the day after the end of the program. If departing on the last day of the program, we recommend booking a flight later than 8pm. Group transportation is not included within the price of the trip. This includes transportation from the meeting location to the trailhead. Guides are not responsible to provide transportation to team members. We often have a mix of local and out of town customers on each Northwest climb or course. Climbers are free to rideshare with other team members at their own responsibility. Our office will forward your name and email to other team members if you give us permission to share your contact information indicating that you are interested in ridesharing. The NWAG office does not coordinate ridesharing/ carpooling. In some cases, a Northwest Alpine Guides staff member can provide limited transportation from Seattle or Bellevue to the trailhead as a fee service.